God has given us amazing minds. These powerful instruments possess an almost limitless capacity to remember. Memorizing Bible verses is a skill and discipline that yields lifelong rewards (Joshua 1:8; Psalm 1:2-3). Learn Bible verses together with your child. Discover the marvelous mental potential that God has given to you. Shapes the way we view the world. Makes God’s Word accessible 24-7. Shields us from the enemy. Provides a conduit to God. As a class project, create memory cards containing suggested Bible memory verses. Send them home along with an encouraging note asking parents to help their children memorize the verse each week. 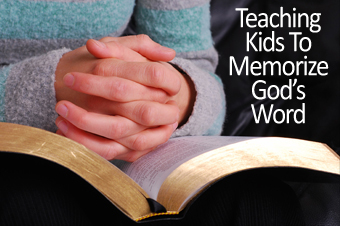 Show the kids that you memorize Bible passages, too. Encourage parents to memorize the same Bible verse each week as well. Emphasize the importance of repeated exposure to the weekly Bible verse at church, home, and even school. Encourage parents to copy the weekly memory card and include it in their child’s lunchbox. John Piper – Why memorize Scripture?